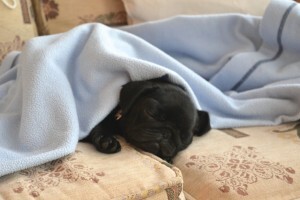 Hiya I am very interested in adopting this baby, I have wanted a pug for years and am ready to give one a forever home . I have a 3year old pug called Mr Pickles I would love a black girl to join him,I rescued Mr Pickles he’s a big part of our lovely family . I live in East Sussex, right in the middle of the Ashdown Forest so lots of lovely places to take dogs for a walk. I have a pug x shi tzu called Gizmo whose almost 6 months old. She loves being around other dogs especially those her own age and I really want to get her a fellow pug housemate. Either genders fine, preferably one close to her age if possible. My sister has a pug, (almost 7 years old), who used to spend a lot of time round mine but she moved recently. Pugs are the only breed I’m interested in. I’m not wanting to breed them so spayed or nuetered would be more than fine. Hello,we are looking for a pug as a family pet.I have a ten year old son who would love one.We live in a first floor two bedroom flat,we have communal gardens and woods close by,would we be considered for one,please help…..
Hello, i have looked everywhere to rehome a pug and i can’t find one anywhere. I would really love to rehome a pug so can you please contact me if you have any pugs at all? Any colour and gender. I’ve adopted dogs before and I love to give them a good home. I’d be very grateful if you had 1 for us.